You have added Park Avenue Pretty Ivory and Black Collarless Tweed Jacket into shopping cart. No need to break the bank spending a fortune on a designer jacket--you can get the same look for less here! The Park Avenue Pretty Ivory and Black Collarless Tweed Jacket is fully lined. It is made of a black and ivory patterned tweed fabric and has a classic cut with a slightly shorter cropped shape. The rounded collarless neckline an vertical gold buttons down the front of this jacket combine to create a flattering shape. 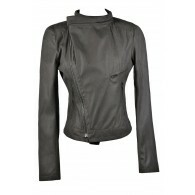 A contrasting black fabric trims the shoulders and top back of this jacket. The Park Avenue Pretty Ivory and Black Collarless Tweed Jacket is the perfect wardrobe staple to toss on when you want to look chic and refined with minimal effort. Wear this jacket casually with denim and ballet flats for a day of shopping. Or dress it up for work with black trousers and a fitted black top. It also pairs well with skirts. Details: Fully lined. Shell: 100% polyester. Contrast: 47% polyester, 43% cotton, 10% metallic. Lining: 100% rayon. Dry clean only. Small measurements: Length from top of shoulder to hemline: 19". Bust: 34". You have added Park Avenue Pretty Ivory and Black Collarless Tweed Jacket into Wishlist. You have added Park Avenue Pretty Ivory and Black Collarless Tweed Jacket for Stock Notification. You have set Park Avenue Pretty Ivory and Black Collarless Tweed Jacket as a loved product. You have removed Park Avenue Pretty Ivory and Black Collarless Tweed Jacket as a loved product.